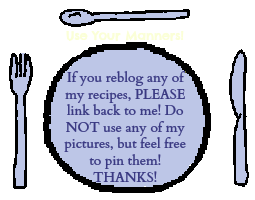 I shared our dinner menu for this week on my Facebook page and had some interest in the recipes. I joined a local Moms club a couple months ago and every Monday we share our weekly meal plans. This has sort of gotten my creative juices flowing again in the dinner department. It's made me more creative which I think Derek and the Bigs are appreciating! I've been doing a lot of the prep work during Lydia's nap time. This lets me basically throw whatever into the oven or in the skillet come dinner time. I've also been using ingredients that are sort of pre-prepared such as this spice blend and the bagged slaw mix. I don't have time to dig through my spice cabinet and measure out a handful of different spices! I don't have time to chop and slice all those veggies! As I'm meal planning I'm always thinking about leftovers. I like to make things with extra protein so that I know I'll have some for lunches the next day. Tonight I decided to throw in a pound of shrimp with these tuna steaks just to be sure I have a good lunch tomorrow. 1) Start rice in the rice cooker. While that is cooking prep tuna steaks by patting them dry on both sides, pour spice mix onto a small plate and give each steak a light spray/drizzle of EVOO. Press each steak into the spice mixture and grind black pepper on top to taste. Make sure both sides of the steaks are completely coated in seasoning then refrigerate for at least 30 minutes. 2) Cook shrimp in a teaspoon or so of sesame oil, sprinkle with salt and pepper. Set aside. 3) Saute slaw/ stir fry veggies and mushrooms on medium-high heat with some sesame oil, salt, and pepper. Cook 8-10 minutes, stirring occasionally. Set aside when done. 4) Heat a teaspoon of sesame oil over medium-high heat for a minute or two, spread it around the pan to make sure the steaks won't stick. Cook steak 4-5 minutes per side. Tuna steaks should be red-pink in the middle. I would've gotten a better picture of the finished product but by the time I was done cooking everything my house smelled heavenly and stomachs were growling! I do believe this dinner may be in the regular rotation.